I started a list at work a few months ago of poorly spelled words that our guys would send in on their reports and e-mails. One day at work, I was talking to a client and said the word “visceral” over the phone. Angie remarked that she was surprised I used the word or that I even knew the meaning of it. So we started a list of the best word that was used in the office that day. What it has turned into is a diary of sorts where we can look at a word and remember what was happening on that wretched day when that certain word was uttered. 2/7/07’s altercation came from one of our guys interacting with a store manager in a most unprofessional manner. 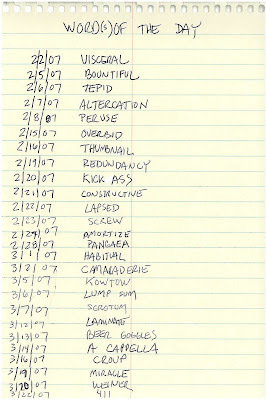 The 2/8/07 word made both lists. The guy was trying to say pursue as in “pursue a lawsuit” and said peruse instead. A misspelling and a word(s) of the day… bonus!